Toby and Sammie designed this cake as a terrarium for their reptile collection. 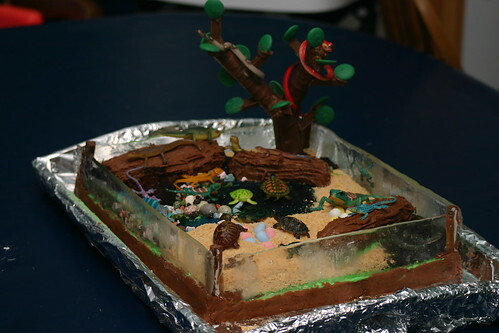 Everything on the cake (apart from the reptiles) is edible - the tree is chocolate, the glass sides are made from mints, and the sand and dirt are cookie crumbs. The pond in the middle is melted coloured sugar. The kids at the party thought it was really cool to be able to eat "broken glass" and "dirt"!